Time to Play: 15-20 Min. The young ice giant has a big problem: he wants to buy fish sticks, but he cannot remember how many and he has nine shopping lists in his basket. So he goes from igloo to igloo and shakes each. In each he listens to the delicious fish sticks bouncing off the igloo walls. When he thinks that the igloo in his hand has the same number of fish sticks as one of his shopping lists, he takes it home. When he gets home, there are no fish sticks in the igloo. 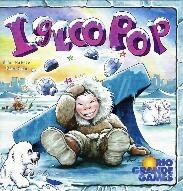 Instead, wild and laughing Eskimo children tumble out of the igloo. Excitedly they shout, "Shake us again!" "That was great fun!" "This is super", thinks the young ice giant. "Now, I have found some new friends to play with!" And, he promptly forgets all about his shopping list.